Mutare — Forty two bodies of the victims of Cyclone Idai have so far been positively identified and buried with the assistance of the government, a cabinet minister has said. Public Service Minister Sekai Nzenza told the media after a brief meeting with Vice President Constantino Chiwenga at the government complex Tuesday that the army has managed to reach Ngangu where 42 people were buried following traditional customs. Chiwenga had visited to assess the situation on the ground following the violent cyclone which ravaged parts of Manicaland province over the weekend killing dozens, displacing hundreds and destroying infrastructure. 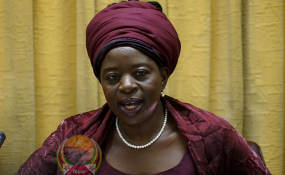 "We are in the process of burying the deceased and the army has managed to reach Ngangu where 42 victims have been positively identified and buried using the local traditional customs," she said. She added that they were following the tradition to avoid disputes later on after the burial. "We are following our customs that people are buried according to their tradition. We don't want a situation where tomorrow people will say the victims were buried on the wrong places or there were mass burials," she said. Nzenza said government was working with traditional leaders to ensure that the burials were done in accordance to local tradition. "We are talking to Chiefs Saurombe, Ngorima. We are glad they have the same totem which is Chirandu. So their tradition is the same," she said. The minister said government is really conscious of the importance of giving the deceased some decent burials. She said government was also providing support to every family that has lost a relative in the disaster. "We have started with $1 000 per family per burial but this morning minister July Moyo (Local Government) said we might have to increase the funding and we are also supporting with food," she said. Nzenza said First Lady Auxillia Mnangagwa has also paid her condolences and donated a truckload of foodstuffs to the affected families, adding, "The food will be taken to areas such as Ngangu in Chimanimani although there are still some accessibility challenges due bad road network." She said although the death toll officially still stood at 98, they were receiving some reports of deaths in some places as the army intensifies the rescue and search mission.